i can't undersatnd why i am getting these error. @gauravsharma0190 Nothing is all right with this code. where is cedge declared? You're trying to access a variable which was not declared. This one says that you first declared the function extern and later static. Why? Since it is just a function it neither has to be static nor extern! You really have to fix your code! And I really don't understand why you think your code is OK although there are really basic issues (not related to Qt at all)! i declare all these variable inside onTrach.cpp file. blur is function name which is in imgproc.hpp header. Canny is also function name which is declared in highgui.h header. Can you post onTrach.cpp and onTrach.h? 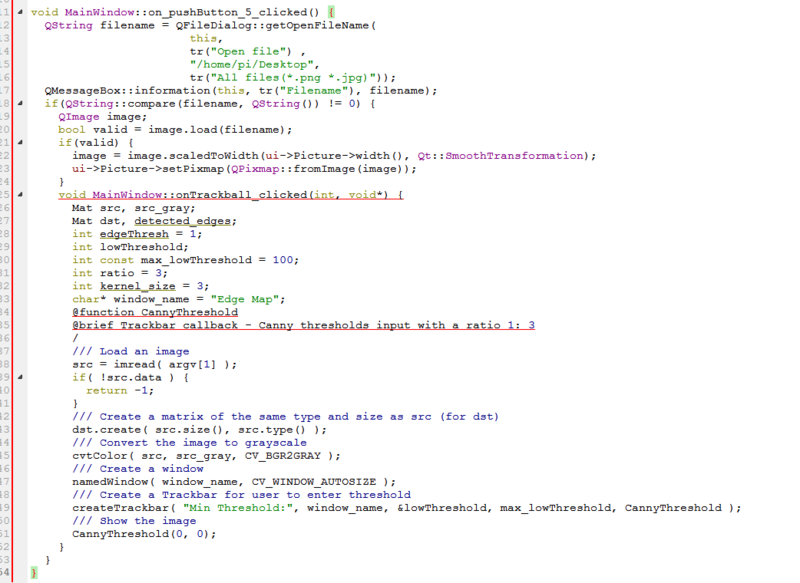 all these functions are present in header which i added in code. @gauravsharma0190 What is Mat and where is it declared? @gauravsharma0190 Most probably it crashes because of an invalid pointer. Debug your application step by step to see where exactly it crashes. @gauravsharma0190 Put a breakpoint in the slot which is called when you press the button and check where exactly it crashes. It crashes when i press the push button . I debugged it and found it creshes when my function call. Error found->it takes signal from OS. @gauravsharma0190 How to fix what? What do you mean by "Error found->it takes signal from OS" - what OS signal do you mean? Do you mean SIGABRT? I don't know how to fix it because I have no idea what the problem is. But usually such problems are caused by bugs in applications. You have to check your code and see what is wrong at the line where your application crashes. @gauravsharma0190 Can you post the code and mark the line where it crashes? @gauravsharma0190 What are src_gray, dst, threshold_value, max_BINARY_value,threshold_type? Where are they defined and initialized? Please note: these are NOT same as in MainWindow::on_onTrackball_clicked()! These are defined in the same function .cpp files.